Early in the planning for the raid, Manor received a letter from Adm. Thomas H. Moorer, the chairman of the Joint Chiefs of Staff, ordering everyone in the military to give Manor whatever he asked for, no questions asked. It was the kind of blank check that Cochran and Alison’ had received from General Arnold as they prepared for their Burma operation a quarter of a century earlier. Manor was also given the authority to make his own decisions without referring everything back to Washington. As the time for the raid approached, he was faced with a crucial decision. The weather forecasters were anxiously watching the approach of a typhoon that appeared ready to sweep in over the South China Sea, where the carriers operated, and into North Vietnam in the next few days. On his own authority, Manor gave the go-ahead for the raid to be conducted one day early, on 20, rather than 21, November. Overcoming the natural temptation to climb into a cockpit and lead the raid himself, Manor flew to Da Nang and set up shop atop Monkey Mountain at a major United States communications base. There, he had direct links not only with the raiding force but also with the Navy carriers and the other supporting forces. An open line connected him to Adm. John McCain, the commander in chief, Pacific, in Hawaii—whose son was a prisoner—and Admiral Moorer in the Pentagon. He was thus in a position to monitor and, to some extent, control the entire operation and to make decisions if anything went wrong. The raiding force took off from Udorn at 10:56 P.M. Three of the helicopters carried the soldiers. The other three came along to pick up the rescued prisoners, although one of these was also designated a gunship to knock out the guard towers. One of the trickish parts of the operation came over Laos, before they crossed the border into North Vietnam. The MC-130 pathfinders moved off to the side, and tankers moved in to take their place. The tankers had only dim lights on their wing tips. The helicopter pilots first had to find the tankers in the darkness. Next, they had to nestle into the angle formed by the plane’s wing and its large tail and then lunge forward to insert the drogue protruding from the nose of the helicopter into the funnel-shaped basket at the end of a hose hanging out from the tanker’s wing. Although aerial refueling is practiced often, it never really becomes routine, especially over the dark mountains of a strange land, with the dangers of combat in the offing. The crews of both aircraft worried, understandably, about the possibility that the helicopter’s huge main rotor might strike the tanker’s vertical stabilizer. The tension was most pronounced for the crews refueling on the right side of the tanker. Since the drogue protrudes from the right side of the helicopter, refueling on the right side of the plane forces the pilot to fly about six feet closer to the tail. A major concern was refueling the HH-3 helicopter. The chopper was barely able to keep up with the tanker and just didn’t have enough power to overtake the tanker and move into position to take on fuel. Instead, the tanker pilot had to drop down below the helicopter so the HH-3 pilot could dive down into position behind the tanker. Even after weeks of practice, it was still very much of a white-knuckle feat. As soon as they had topped off the helicopters’ tanks, the tankers moved off, the pathfinders moved back in, and the raiders headed east again toward Son Tay. Manor had planned the entire operation down to the second. Timing was especially crucial on the approach to Son Tay, because there were two radar stations west of the prisoner compound. The raid planners figured they needed at least twelve minutes between any warning and their landing at Son Tay. But the radar stations were far enough west that, if either one had detected the approach of the raiding force, they could have denied the raiders this twelve-minute zone of relative safety. Intelligence analysts discovered that there was a brief time when both radar stations were looking away from the route of the raiding party. With precise navigation, the two mother-duck pathfinders and their ducklings flew right through the gap and approached Son Tay undetected. Following the plan, the HH-3 dropped into the compound, hitting the ground so hard that one of the crew members was thrown from the plane. Despite the severe jolt, the crew members and the sixteen Green Berets aboard survived the landing without injury and proceeded with their attack. One of the HH-53 helicopters—carrying Simons—landed at a compound that had been identified as “the secondary school” but was actually a military installation, about four hundred meters southeast of the prisoner-of-war camp. The soldiers jumped to the ground, and the helicopter lifted off to loiter nearby. The Green Berets immediately became involved in a furious firefight which went on for about four minutes. Then the helicopter pilot returned, picked up the soldiers, and moved them to the POW compound. The Al-E Sandys that had accompanied the raiding force circled overhead, strafing the approaches to the camp. Inside what was believed to be the cell block, the Green Berets quickly went from room to room with disappointing results: there wasn’t a single prisoner in the compound. A code word was flashed back to Manor, waiting for news at Monkey Mountain. The raiders had achieved complete surprise. But by the time they were ready to board the helicopters and depart, the raid itself and, even more, the Navy’s mock assault had stirred the North Vietnamese defenders into furious activity. Supporting the attacking force were F-4 fighters prepared to fend off any North Vietnamese fighters that might take to the air. Also in the air overhead were F-105 Wild Weasel fighters, whose job it was to provoke the missile crews and then launch their own missiles to home in on the ground-based radar. Sixteen surface-to-air missiles were launched, and two of the F-105s were hit. Another twenty SAMs were fired at the Navy planes involved in the diversionary raid, but none of them was hit. Sitting in his helicopter waiting for the withdrawal, Col. Royal A. Brown looked upward. “They started firing SAMs, and you’ve never seen as many SAMs as were fired that night,” Brown recalled. “I saw two 105s get hit. My job was to see that everybody got out, the rescue forces. I was the last airplane left. I saw the 105s get hit, the first one, like this big ball of fire. I didn’t think anybody would get out of that, but he made it back to Udorn. “The second one got hit. I didn’t think anybody would get out of that either, but he kept going. He bailed out over Barrel Roll [an area in northern Laos], and they picked him up. Once the last helicopter lifted off, there was a momentary sense of relief. But the battle was not over. Brown’s account of the MiG attack is an example of how confusing things can get in the heat of battle. Manor says that, at that point, no MiGs had yet taken to the air. What Brown saw was a United States A-1 firing off a rocket rather than land with the rocket still on its wing. As Brown later learned, one of the two damaged F-105s managed to make it back to Thailand. The two-man crew of the other plane ejected and parachuted down into northern Laos. Manor, from his position near Da Nang, took charge of the rescue operation: he ordered the helicopters emerging from the raid to look for the downed airmen as they crossed into Laos. They managed to find the fliers and swooped down for an impromptu rescue of the two men. When all the aircraft had returned to their bases, the losses were totaled up. The United States had lost one F-105 and the helicopter that was purposely left behind. One of the soldiers had suffered a minor injury. But the raid had not succeeded in its goal of rescuing prisoners. Clearly, there had been doubts about whether the prisoners were still there. Early in the planning, serious consideration was given to having a spy go by the compound to try to determine whether the prison was still in use. But that was ruled out as too dangerous. If the spy had been caught, he might have been forced to send back a false report that would have led the raiders into a trap. When the American prisoners were released by North Vietnam, Manor met them in the Philippines and learned that the men had been transferred from the Son Tay prison in mid-July, several weeks before he had been given the assignment to try to pull them out. Was the raid, then, a failure? All the controversy surrounding the failure to find prisoners in the camp tended to obscure the positive features of the raid. 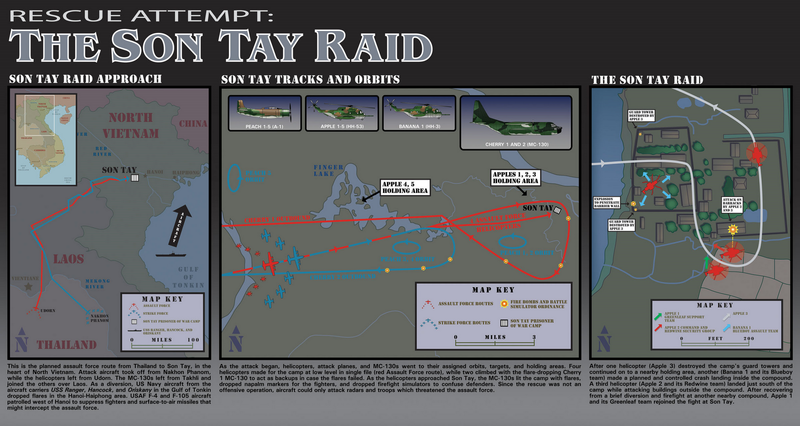 As a military operation, both in planning and in execution, the Son Tay raid was almost flawless. Unfortunately, many of the lessons learned and the flying techniques developed in the Son Tay raid were soon forgotten, with tragic results.